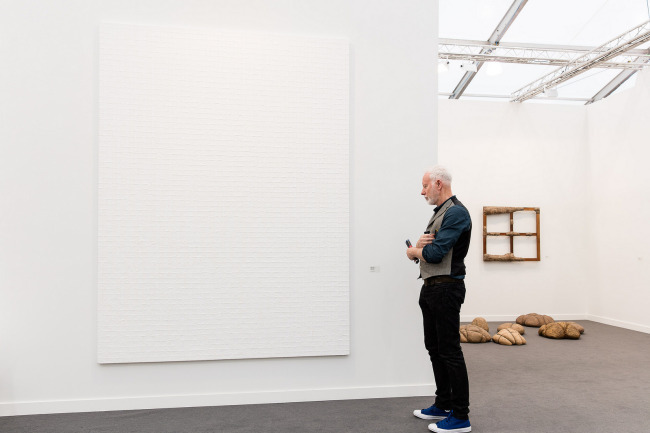 NEW YORK – From refined monochrome paintings fit for elegant modern interiors to cutting-edge works that reflect the dynamic sociopolitical landscape of Korea, the fifth edition of the Frieze art fair in New York featured various aspects of Korean modern and contemporary art. 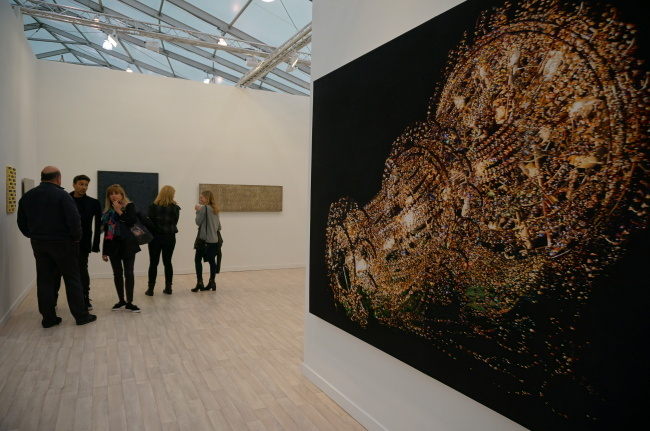 The five-day art fair, which ended on Sunday, gathered both big names and less well-known talents, connecting major galleries and artists to collectors, curators and museums, plus more than 40,000 public art lovers, according to Abby Bangser, artistic director for America and Asia of Frieze New York. It included a wide range of Korean artists including familiar Dansaekhwa (Korean monochrome paintings) masters, first-generation avant-garde artists and cutting-edge artists that have been recognized in the contemporary global art scene recently. They were represented mainly by the Seoul-based Kukje Gallery, Gallery Hyundai and Tina Kim Gallery in New York, in the fair’s main section. Frieze New York, which began in 2012 branching out from its London fair, invited more than 200 galleries from 31 countries to present works of their artists to global audiences. Seoul-based Kukje Gallery presented paintings of major Dansaekhwa masters and some of the leading artists in the contemporary Korean art scene, in a joint showcase with Tina Kim Gallery in New York. Its diverse lineup of artists included Lee U-fan, Park Seo-bo, Ha Chong-hyun, Kwon Young-woo as well as younger emerging artists, including Yang Hae-gue, Ham Kyung-ah, Michael Joo and Park Chan-kyong, whose artistic activities transcend national borders and traditional art boundaries. In their pursuit of sociopolitical issues, Ham and Park explore North and South Korean tensions and conflicts using two different mediums – embroidery and media. “Galleries think about their presentations at Frieze as exhibitions. They are very thoughtful, curated and considered. And it’s not the case maybe at every fair. It’s a particular Frieze angle,” said Bangser, in an interview at the fair. Gallery Hyundai presented works of two major groups of Korean artists who dominated the Korean art scene in the 1950s to the 1970s. It highlighted Dansaekhwa artists and some Korean avant-garde artists who emerged in the 1960s and 1970s. “We aim to show (the) diversity of Korean art through the mainstream Dansaekhwa artists and the avant-garde artists that were lesser known,” said Chang Hee-jeong, manager of Gallery Hyundai. Its Dansaekhwa artist lineup consisted of familiar names such as Lee U-fan, Chung Sang-hwa, Kwon Young-woo and Park Seo-bo. Also under the spotlight were a couple of Korea’s first-generation experimental artists such as Lee Seung-taek, Lee Kun-young and Park Hyun-ki. “We have showcased Lee Seung-taek since the first edition of Frieze New York in 2012. The artist, whose works were not popular before in Korea, has seen his works sold to global art institutions, including Tate Modern in his later years,” Chang added. The conceptual installations of wood, ropes and paper by the 84-year-old artist were showcased at both Frieze London and New York. Paintings of Kim Whan-ki, a pioneer of abstract art in Korea, were featured in the fair’s Spotlight section, which highlighted works of 20th-century artists. “Spotlight continues to explore global positions beyond the Western tradition, rarely seen work from significant figures and surveys of under-recognized artists from across the world,” said Clara Kim, curator of the Spotlight section, in the press statement. The fair also served as a platform for young galleries around the world to promote their artists and as a unique and entertaining art space for visitors through a variety of curated programs. Berlin-based Societe dedicated its booth to a large refrigerator full of bottles of the meal substitute beverage Soylent. Its artist Sean Raspet has worked with a Los Angeles-based startup to develop flavors for the beverage since 2014, in an attempt to explore “outputs made possible by post-industrial production,” the exhibition brochure stated. Multimedia artist David Horvitz hired a professional pickpocket who did not steal wallets from visitors, but secretly put small seahorse sculptures inside their pockets while walking around the fair venue. “Visitors would feel that they were given a piece of art,” said Bangser.